One of the most stunning things I’ve learned from working with thousands and thousands of online publishers is the massive impact that display ad combinations have on both user experience and ad revenue. It makes sense, right? The way ads are represented to visitors affects their desire/ability to continue browsing a site. There are really millions of different ways that ads could be configured on a web page — types, sizes, density, color, etc. Some of these are clearly more annoying than others and some are definitely more effective than others. The problem is that many publishers fail to ever strike a perfect balance displaying ads in an optimal fashion. We talk about these metrics a lot. Things like bounce rate, time on site, and pageviews per visit can help you truly uncover which display ad combinations are winners and losers pretty quickly. While a lot of publishers hold user experience in high regard, many still do not take these key metrics into account when optimizing ads on their site. Are your ad combinations annoying, ugly, or too aggressive? How do you know? The only true north you have is these metrics. One thing that is often overlooked when configuring display ad combinations is the wild variances in user experience metrics that a website may have between all of their different pages. This means that users may respond differently to the same ad combination on the exact same page. In figure 1 above, you can clearly see that on this single site, users that land on page 1 are responding much differently to ads than users on page 2. These two pages would benefit from very different ad treatments. This particular case is related to a site that had a variety of different content. Page 1 was an informational guide on how to construct something; it linked to other site pages and included some longer form content. Page 2 was a reference page. It included definable content. It provided an answer to a common question about measurement. One could assume that users commonly visit this page, get the answer they were looking for, and leave. The user tolerance for ads on both of these pages is much different, but you actually don’t know this until you test it. 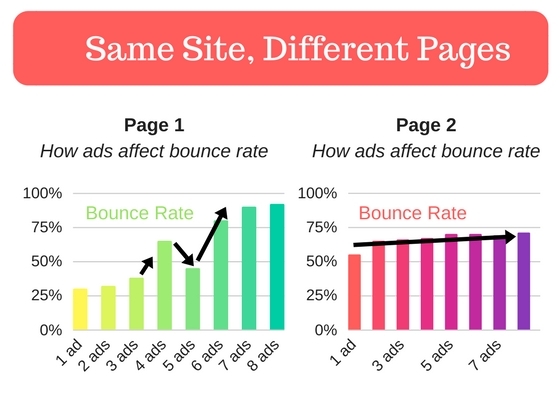 In fact, one of the most interesting things about Page 1 of this site is that the bounce rate increases from 3 ads to 4, but decreases from 4 ads to 5. This is why it is so important to use data to build individual display ad treatments for each page. This is where traditional metrics can actually get you in trouble. Understanding the eCPM and RPM of a particular page can truly lead you astray when evaluating your pages. We’ve discussed this at length before, but I’ll touch on it briefly here because it’s relevant. This is really simplified math, but it highlights why marrying user experience metrics with ad earnings data is so important to understanding the true value of different display ad combinations. 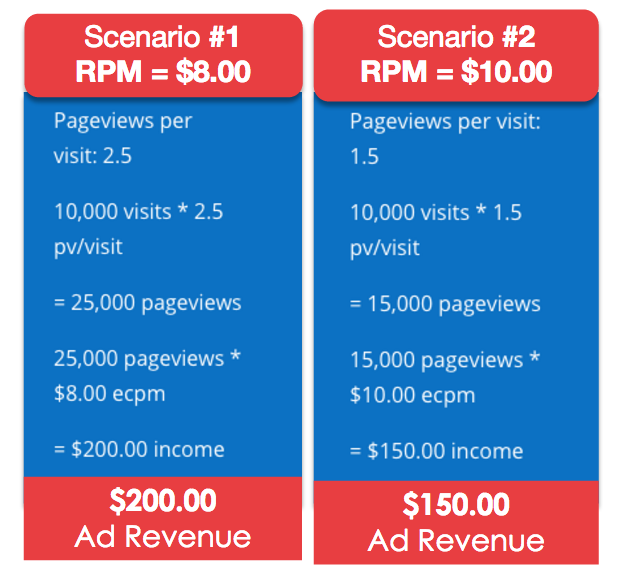 In scenario 1 you have a lower RPM (rate per mille/thousand): In this scenario, visitors hitting these ad combinations are averaging 2.5 pageviews per visit and are accumulating approximately $200.00 per thousand visitors. In scenario 2 you’ve been promised a guaranteed higher RPM by some ad network: In this scenario, the ad combinations provided are a little more annoying and cumbersome and result in only 1.5 average pageviews per visit. This results in only $150.00 per thousand visitors. Without understanding the impact of things like bounce rate and pageviews per visit on our site’s traffic we would all almost certainly all choose the higher RPM in scenario 2. And then… we would make less money while annoying our visitors even more. This is why it is so important to make data-driven display ad choices when building page combinations. In the same way that not all of your site’s pages are impacted by display ad combinations, your site’s visitors all interact differently with different kinds of ad combinations as well. 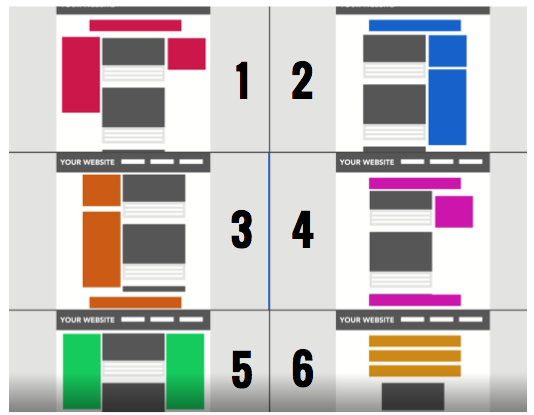 As you can see in figure 2, on the exact same landing page, users have very different responses to the exact same display ad configurations. This means that beyond optimizing ads on a per page basis, that ads need to be optimized for user experience on a per user-type basis as well. This educational website is actually a great example. Different visitors may be trying to get something totally different from the site content; thus some may be more tolerant than others about the display ads. 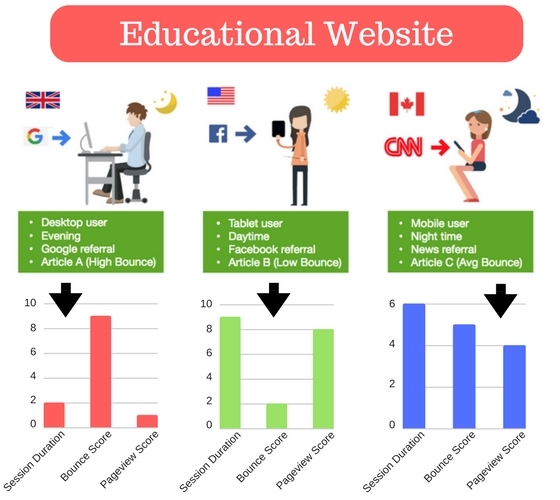 The nighttime desktop user in the evening with the high bounce rate may simply be trying to finish some homework and get off the page. The daytime tablet user may be doing some exhaustive research or curious browsing. And, the nighttime mobile user referred from CNN.com may simply be collecting info on a story they just read. All of these different experiences require different ad combinations. This means optimizing display ads on each page for both the user and the page itself may offer some major UX metric and revenue benefits. Do display ads actually affect SEO too? Outside of things like the mobile interstitial penalty, which Google overtly has warned publishers about, do Google-compliant display ad combinations actually affect SEO? The answer is, yes! This should come as no surprise; as any webmaster worth their salt knows that domain and page UX metrics (like bounce rate) have a direct weighting in most search engine algorithms. So, over time, improvements in these metrics — associated with better display ad combinations — can offer some pretty impressive organic keyword and organic traffic improvements. It has been a very common occurrence for me to see static evergreen content sites experience unprecedented organic search growth simply from improving their site’s UX metrics through ad combination optimization. Evergreen site’s are the best testing grounds for these experiements; as nothing else is changing on these sites during these time stretches. Ultimately, display ads are affecting a lot more than just revenue on your site. They are impacting your users experiences — in both good and bad ways — which in turn is impacting revenue and SEO. The secret is understanding how. In most cases, you have to test this stuff to really understand how the different types of users and pages you have are impacted by your display ad combinations. What about your site? How do your users respond to ads, what are your major challenges? Interesting to see how different content on the page affects the bounce rates. There is no other option but to test different display options for each page.